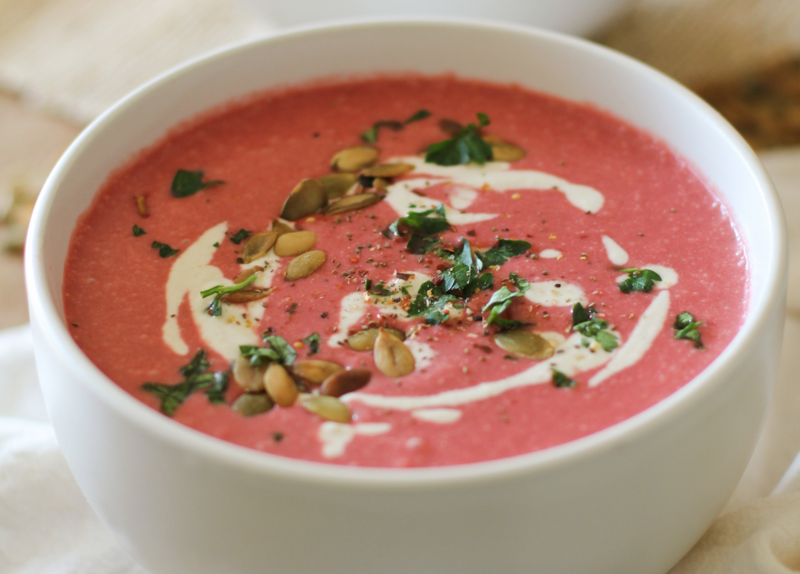 It’s hard to believe this gorgeously creamy pink soup contains no milk or cream, but thanks to the clever use of coconut milk and homemade cashew cream drizzled on top, it’s a dairy-free delight. 1 Place raw cashews in a large bowl and cover them with two inches of water. Allow cashew to soak overnight (or at least 4 hours). 2 Strain water from the cashews and put them into a small blender or food processor. Add the lime zest, lime juice, coconut milk, sea salt and cumin and blend until smooth. Refrigerate until ready to use. 3 Heat the oil in a medium frying pan and gently cook the chopped onion, stirring occasionally until the onion begins to brown and smells fragrant (10-12 minutes). Add the garlic, ginger, cumin, paprika and salt. Sauté for an additional 3 minutes. 4 Add the sautéed onion/garlic mixture to a blender along with the beetroot, coconut milk, vegetable stock and vinegar. Blend well, until the soup is completely smooth. 5 Pour the soup into a large saucepan and heat until it’s just under a boil. Serve soup with a drizzle of cumin cashew cream, raw pumpkin seeds and freshly chopped parsley.